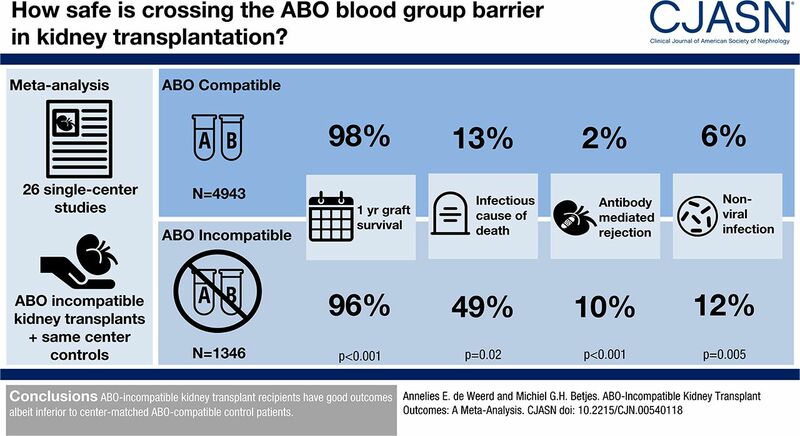 Background and objectives ABO blood group–incompatible kidney transplantation is considered a safe procedure, with noninferior outcomes in large cohort studies. Its contribution to living kidney transplantation programs is substantial and growing. Outcomes compared with center-matched ABO blood group–compatible control patients have not been ascertained. Design, setting, participants, & measurements Comprehensive searches were conducted in Embase, Medline, Cochrane, Web-of-Science, and Google Scholar. Meta-analyses Of Observational Studies in Epidemiology study guidelines for observational studies and Newcastle Ottawa bias scale were implemented to assess studies. Meta-analysis was performed using Review Manager 5.3. A subgroup analysis on antibody removal technique was performed. Results After identifying 2728 studies addressing ABO-incompatible kidney transplantation, 26 studies were included, describing 1346 unique patients who were ABO-incompatible and 4943 ABO-compatible controls. Risk of bias was low (all studies ≥7 of 9 stars). Baseline patient characteristics revealed no significant differences in immunologic risk parameters. Statistical heterogeneity of studies was low (I2 0% for graft and patient survival). One-year uncensored graft survival of patients who were ABO-incompatible was 96% versus 98% in ABO-compatible controls (relative risk, 0.97; 95% confidence interval, 0.96 to 0.98; P<0.001). Forty-nine percent of reported causes of death in patients who were ABO-incompatible were of infectious origin, versus only 13% in patients who were ABO-compatible (P=0.02). Antibody-mediated rejection (3.86; 95% confidence interval, 2.05 to 7.29; P<0.001), severe nonviral infection (1.44; 95% confidence interval, 1.13 to 1.82; P=0.003), and bleeding (1.92; 95% confidence interval, 1.36 to 2.72; P<0.001) were also more common after ABO-incompatible transplantation. Conclusions ABO-incompatible kidney transplant recipients have good outcomes, albeit inferior to center-matched ABO-compatible control patients.